I remember sitting in class in grade school daydreaming about telescopes, probably around 1971, and probably during English, and having pop into my head how cool it would be to have a television with a star chart on it and have a dot move around on the screen that would follow where a telescope was pointing and show its position on the star chart. I've always remembered that. 45 years later the daydream came true. I finally had enough good telescope stuff to make this happen. 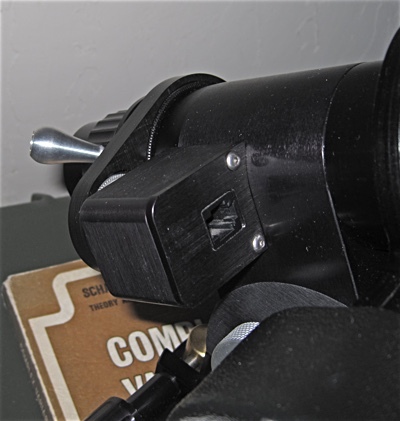 The Losmandy GM-8 mount has mounting places for encoders that will tell some electronics how far the telescope has moved in right ascension (RA) and declination (dec), but Losmany no longer makes any of the encoder sets. They are getting hard to find. 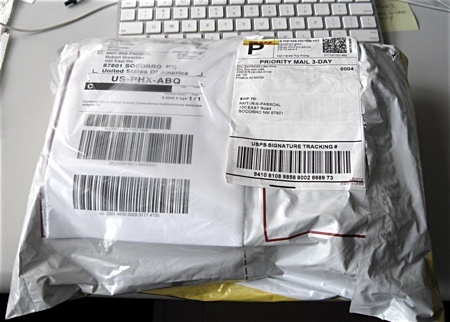 In late January I started watching the usual online marketplaces for astronomy gear every day. I also contacted a few of the dealers that sell the computers that convert the signals from the encoders into a position, and that carried the Losmandy encoders, but no one had any in stock. I waited. The second week of March a used set of encoders and a used set of gear covers showed up on Astromart.com on the same day. I bought them both. 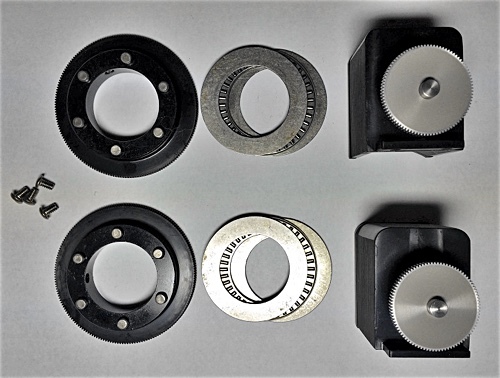 This version of the encoders had a gear mounted to the RA and dec shafts, and a gear attached to the shaft of the encoder. 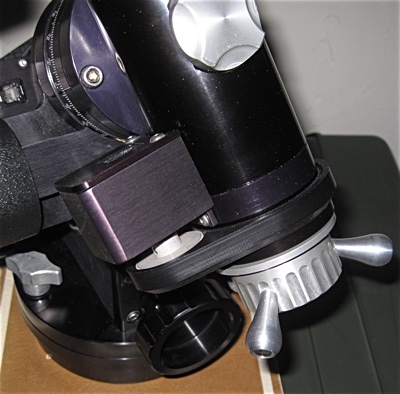 I had been wanting the version that mounted a clear glass wheel to the shaft with many (12288) lines eched in the glass, and an optical reader that mounted to the body of the mount. The last time a set of those had shown up was in 2014, so I bought these geared ones. The encoders arrived on Friday, and the covers on Saturday. Everything went together just like they were made for each other...which they were. There are several different encoder packages made for Losmandy mounts by third parties, but I didn't want any parts hanging out from the mount on the end of a stick, or rubber bands for driving the encoders, or anything like that. I wanted the real thing and got it. To make it all work there was one more piece to this puzzle, and it came in the form of a small package from down under. It lead to several other small packages and pieces which is usually the case. 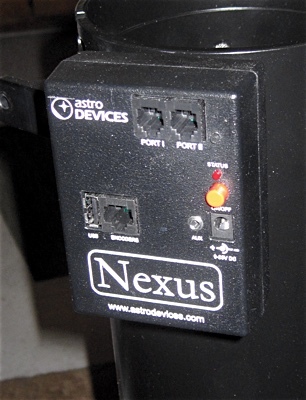 The Nexus system, by Astro Devices, keeps track of the output from the encoders and broadcasts it on a WiFi network that it creates. It's just what I wanted. I wanted the unit to mount close to the action just below the equatorial head of the mount, but be removable like the main system drive console. I fashioned a piece of redwood into a small rectangle that was flat on one side and curved to the same diameter as the 12" mount extension and top of the tripod (both 6" in diameter) on the other side. 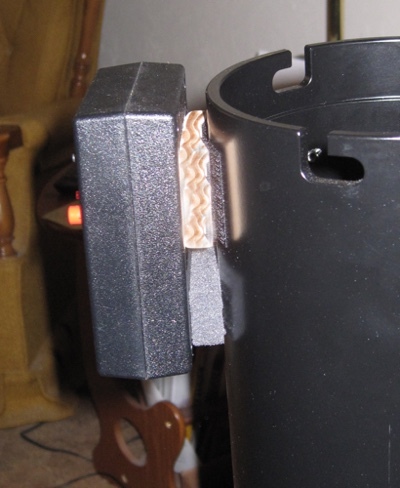 I glued the piece of wood to the back of the Nexus, added a piece of foam rubber below it to help keep the box square to the tube and keep it from rattling around when mounted, and used Velcro stuck to the piece of wood to stick to pieces on the tube or tripod. It worked well in the living room. When I ordered the Nexus the encoders had not quite arrived. Serge, of Astro Devices, made a best guess and put together a Y-cable to ship with the unit that ran from the RJ-45 connector on the unit (where the big plug above goes), to two RJ-12 4P connectors for connecting to each encoder. The wiring in the picture is wrong. When the encoders were connected to the Nexus unit there was no activity. 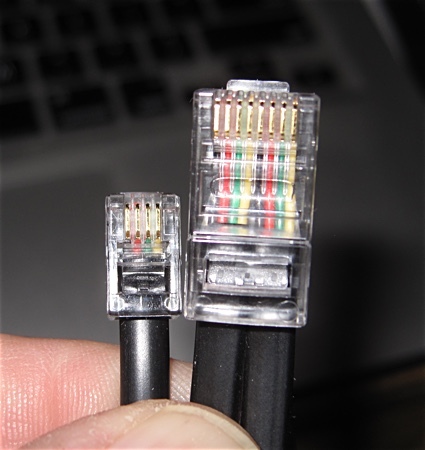 A black/red/green/yellow wire order on the RJ-45 connector needs to be yellow/green/red/black on the RJ-12. On top of that everyone kept saying you can insert a 4P RJ-12 plug (the small one) into a 6P RJ-12 socket (which is on the encoders) and it will work fine. You really can't. A 6P RJ-12 socket is wider than a 4P plug by two more pins. 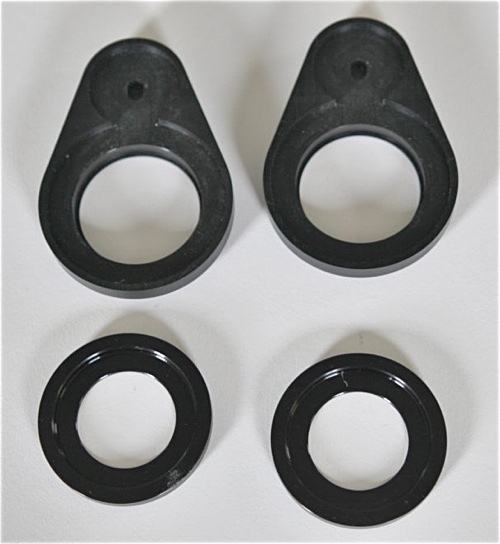 The 4P plug doesn't like to stay in place in the center of a 6P socket and keeps trying to twist, and the outer edges of a 4P plug like to deform the extra/unused pins in the 6P socket. All of this required me to buy a connector crimping kit so I could rewire the Y-cable. The drive motor wiring uses the same kinds of 6P connectors, so I guess it is a good idea to own a kit. Once that came in I redid the wiring and we were about to be in business. By the way, the four wires from the RJ-45 plug go into the center four slots in the 6P RJ-12 connector leaving the outer two pins unused. Showtime! Almost. Well that's not good. With the extra sets of bearings, washers, gears, pins and kitchen sinks added to the declination axis I ran into a bit of a problem. 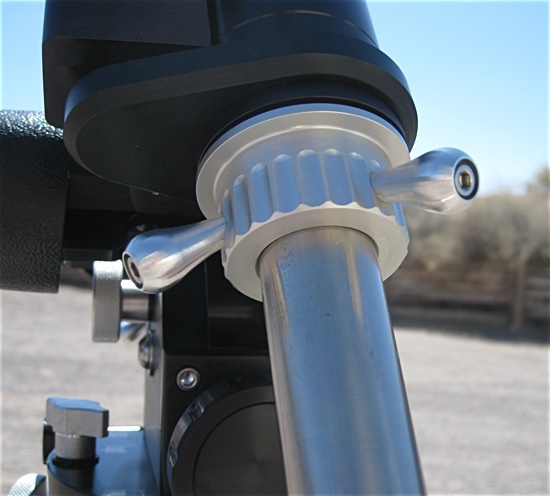 With the counterweight shaft screwed all of the way up into the axis tube, like to keep it from shifting around and/or falling out, there was no way to back off the declination clutch knob so the mount could be moved by hand. That's a fine how do you do. For this experiment I just had to leave the shaft not screwed in all of the way. It sounds dirty, but it was the best I could do. All I had left to do was wait for it to get dark. Darkness came right on schedule. I turned on the Nexus unit and fired up SkySafari 5 Pro on my iPad. After getting the iPad connected to the wireless network created by the Nexus by telling SkySafari to connect to the correct wireless network and port, telling it that it was talking to a "basic encoder" system, and that there was going to to be 8192 'ticks' of the encoders per revolution of the mount I moved the mount around a bit and the cursor moved! 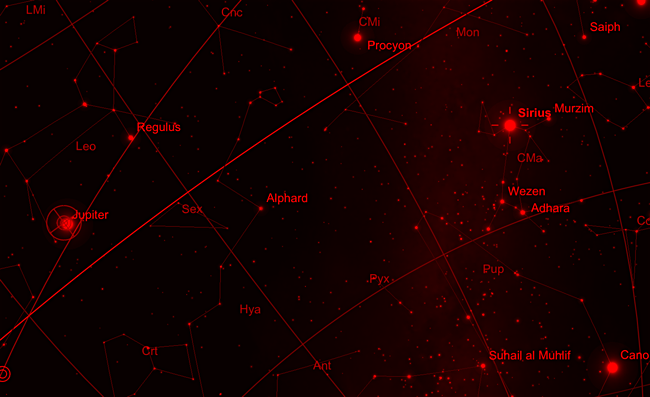 I tapped on Jupiter, pointed the telescope at Jupiter, then told SkySafari to use whatever the encoders were saying as the first alignment point. Then I tapped on Sirius, swung the scope over to there, and told SkySafari to use those encoder readouts as the second position. This is a two-star alignment even if one of them is a planet. Now for the daydream come true part. 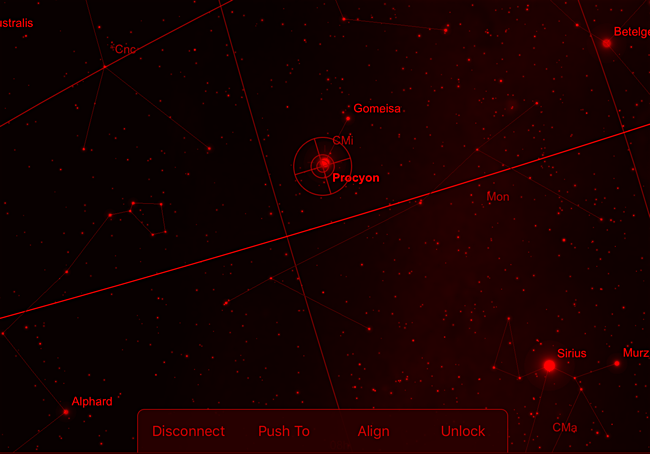 I moved the telescope while looking at the iPad until the target was on Procyon...looked through the ocular...and there it was! Just like in the movies. In the overall scheme of life it is a simple little thing that has been done many times before by others over the 20 years or so that I've been away from astronomy, but for me it made my...hmmm...let's say decade. You can see that the target was not right on Procyon, but the telescope was. Since we are talking about sophistcated and infallible hardware and software here I guessed that this could only be attributable to some kind of human error. You know, the kind of 'AE-35 pointing unit failure' thing that HAL got so pissed off about in 2001? You always learn a few new things each time you go to the field, and usually spend a bit more money for the lesson, and when I finish making a few adjustments, and the weather cooperates, I'll try it again. I think this Nexus-SkySafari system will be a lot of fun. A few days after this outing I met up with Ronnie The Machinist, and over lunch he took off an additional 1/2" or so of material from the shaft and solved the clutch knob problem. 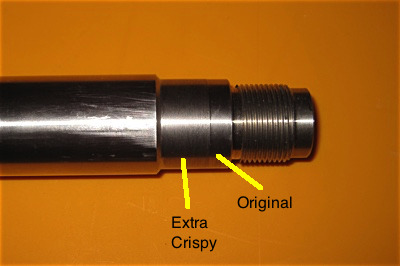 You can see in the picture where the outer layer of the shaft had been cut back to originally -- about 1/4" back from the threaded section -- and where it was after Ronnie got through with it. Now there is plenty of space. I can even add a couple more kitchen sinks to the shaft if I need to. UPDATE: So it turns out that the pointing error on Procyon really was attributable to human error. I thought that I was placing Jupiter and Sirius (and all of the alignment stars that followed) in the middle of the scope's ocular field during alignment, but I was off more than I knew. 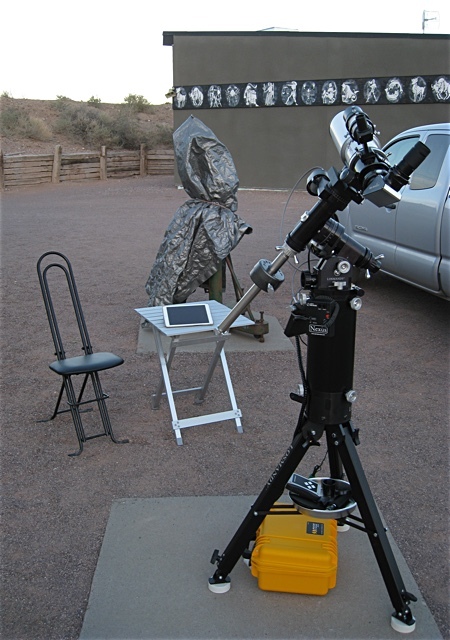 During an outing at the end of October I used an ocular in the main scope with crosshairs to do the two-star alignment. That made things MUCH better. Yes, it only took me all summer to figure this out.